Backpacking Philippines: Bienvenido a Zamboanga Hermosa! "Bienvenido aqui na Zamboanga" what greeted Tutubi in Asia's Latin City's Zamboanga International Airport where people speak Chavacano, a Spanish Creole language. There were so many policemen at the airport, not because there's trouble, but due to an on-going security conference, incidentally, held at Tutubi's hotel: Garden Orchid Hotel. A stone's throw,literally, from the airport, Garden Orchid Hotel, would be Tutubi's home for a few days. The the check-in counter ladies of the hotel were nice and accomodating. Even the bellboy was kind enough to give Tutubi the last copy of the Zamboanga City tourism brochure that Tutubi used to explore the city of smiles. Looks like a nice enough place. 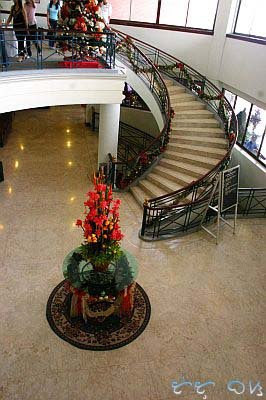 Nice staircase; the curve made it classy. boracay is a perfect place to spend a vacation..